We already have some Expansion Modules that can be plugged in the RF Explorer main unit to extend the frequency coverage to a new band. For instance, a main unit working in the 868MHz band can be extended to cover 2.4GHz band as well. Now the question: Some users wanted to customize the way RF Explorer works. Probably the best way to do that is to offer an Arduino compatible Expansion Module which will embed an ATMega328 which will communicate with the main MCU of RF Explorer to manipulate screen and RF parameters to fully automate the custom action you may want. It will also expose some external header connectors to give the ATMega328 with external connectivity to the world for additional functionality. OPtional a signal strength indicator that delivers 0..5V so it can be connected to an analog in. If I understand you correctly, do you mean you see value in an external connection, not bypassed by Arduino, which allows you to connect RS232 directly, together with a analog indicator? That can be done and will be cheap, but won't allow users to customize the device except by using external circuitry which makes the whole solution more fragile. Note external connectivity is available already, although through USB. 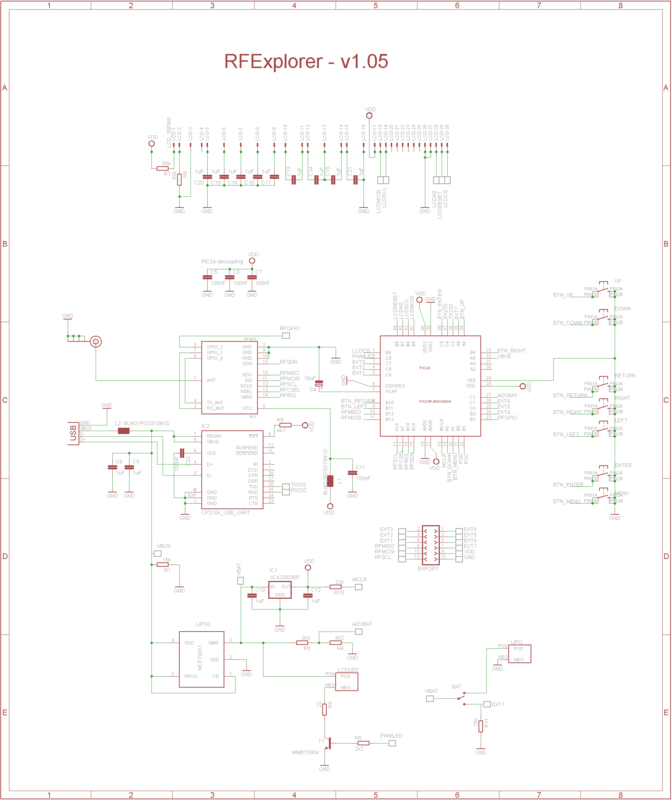 Any schematic drawing avalible for the RF Explorer? The Arduino platform, being open sourced hardware, has kind of spoiled us in our expectations of what great documentation can be like. SparkFun seems now to provide such open documentation on most all their break-out and prototype modules. Sure, please refer to Hacker's corner page. Thanks for that and I did look for it before asking, but I still can't seem find a link or download button for a schematic drawing?